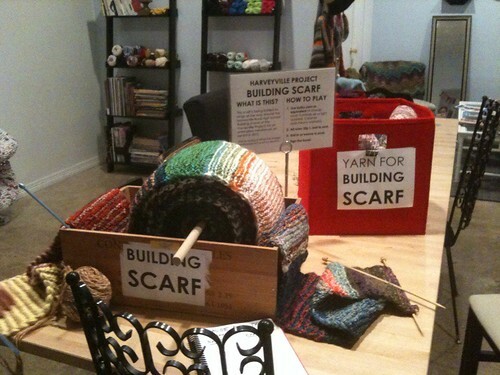 Building Scarf at GAUGE in Austin, TX! Thanks to GAUGE for hosting the Harveyville Project Building Scarf this week! This scarf is being knit to wrap around the entire HRHS building for an alt/indie needlework art show in 2012. This baby was hibernating for most of last year, but she’s back out & if you live in Austin, I’d love your help knitting her. I expect I’ll only be able to tote it around until it’s about 150 feet & the remaining several hundred will need to be knit on site. So the more progress we can make now, the better! There’s a big bin of yarn on hand, or you’re welcome to bring your own (either bulky or strands combined to = bulky–4 strands sock, 3 strands dk/light worsted, or 2 strands heavy worsted). It’s a great way to get rid of any hated yarn that’s crapping up your stash but that you fill guilty about tossing. The scarf will be at GAUGE thru Thursday & Thursday night I’m bringing it to Arts & Darts at Rio Rita. Two can knit at once, so bring a friend! So cool! Austin is such a great groovy town!